2 - To lengthen or enlarge your tyres footprint which will give you greater traction. However tyre pressures below 18 psi (124 kpa) run the risk of the tyre either rotating on the wheel rim or worse it allows the tyre to completely deflate and come off the rim. This allows the problem of dirt and mud to enter the inner air chamber or come inton contact with the tube (if fitted) thereby damaging the tube or causing resealing tyre bead problems. Now you have 2 separate air pressures, allowing you to control with confidence the pressure you wish to run in the tyre. Secondair are an added safety feature to any vehicle. SecondAir weigh less then 1.5kg each and being distributed completely over & around the wheelrim inside the tyre present no problem with wheel balance. 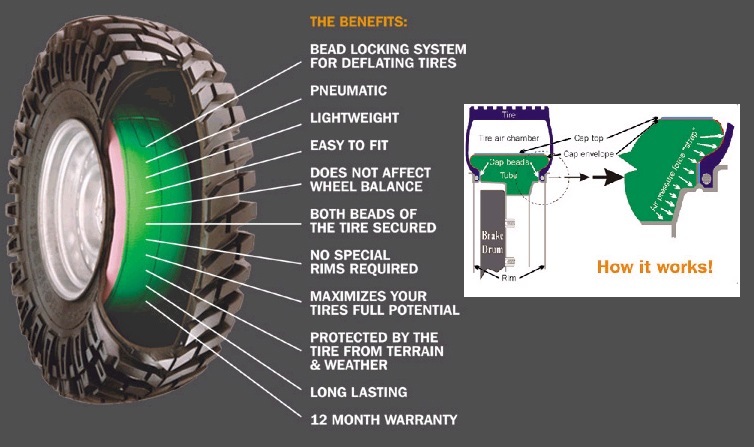 Being inside the tyre the SecondAir is unaffected by weather or damage by rocky terrain. This feature allows long life for the product. The beadlock tube pressure can range from 34psi to 48psi (234 to 330 kpa) depending on the degree of terrain difficulty or whether used in competition. SecondAir can easily be fitted to most 1 piece steel rims and tubeless tyres.